A recipe is merely words on paper; a guideline, a starting point from which to improvise. It cannot pretend to replace the practiced hand and telling glance of a watchful cook. For that reason feel free to stir your own ideas into this dish. When you cook it once, it becomes yours, so personalize it a bit. Add more of an ingredient you like or less of something you don?t like. Try substituting one ingredient for another. Remember words have no flavour, you have to add your own! 1. Spread mustard on 3 slices of bread. Place 1 piece of ham and 1 piece of cheese on the other 3 slices. Top with the remaining slices. Spread each side with butter. 2. 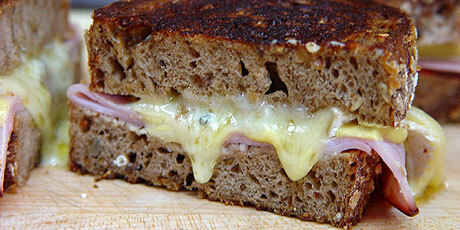 Heat pan over a medium heat and toast sandwiches for 2 minutes per side until golden brown and cheese has melted.